Cal Newport's clearly-written manifesto flies in the face of conventional wisdom by suggesting that it should be a person's talent and skill - and not necessarily their passion - that determines their career path. Newport, who graduated from Dartmouth College (Phi Beta Kappa) and earned a PhD. from MIT, contends that trying to find what drives us, instead of focusing on areas in which we naturally excel, is ultimately harmful and frustrating to job seekers. The title is a direct quote from comedian Steve Martin who, when once asked why he was successful in his career, immediately replied: Be so good they can't ignore you and that's the main basis for Newport's book. Skill and ability trump passion. Inspired by former Apple CEO Steve Jobs' famous Stanford University commencement speech in which Jobs urges idealistic grads to chase their dreams, Newport takes issue with that advice, claiming that not only is thsi advice Pollyannish, but that Jobs himself never followed his own advice. From there, Newport presents compelling scientific and contemporary case study evidence that the key to one's career success is to find out what you do well, where you have built up your 'career capital,' and then to put all of your efforts into that direction. Een goed advies is om niet klakkeloos je passie te volgen! 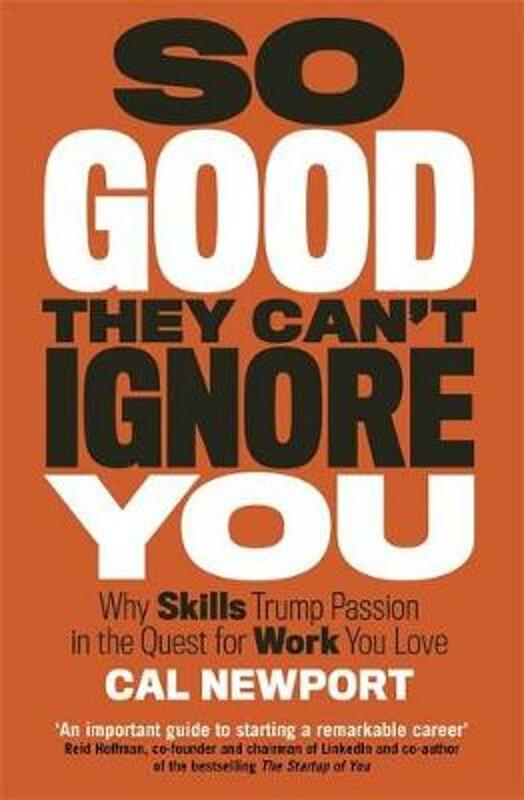 Dit boek helpt je om gericht te kijken naar plezier in je carrière door jezelf niet af te vragen "welk werk past goed bij me" maar "wat kan ik toevoegen aan deze wereld"
"working right trumps finding the right work"
Een leuk geschreven en praktisch boek. Dit boek geeft een mooi tegengeluid aan de zelf help boeken die zeggen dat je gewoonweg je passie moet volgen en dat alles dan goedkomt.